Bushnell AR Optics 1-4x 24mm FFP Illuminated BTR-1 BDC Reticle AR-223 Riflescope is one of the most famous scopes used with AR platform rifles. It is made up of highly durable aluminum alloy material. Along with anodizing finishing, this rifle scope is perfectly sealed in order to protect the inside from other elements. It is a low-light riflescope that provides quick power charges because of its exclusive ‘Throw Down Power Change Lever’. 1-4×24 with Drop Zone-223 BDC reticle for midrange precision and to achieve excellent close-quarters accuracy. 1-4×24 with first focal plane Illuminated BTR-1 reticle offers outstanding low-light performance and accuracy level holdovers up to 500 yards. Bushnell AR Optics 1-4x 24mm FFP Illuminated BTR-1 BDC Reticle AR-223 Riflescope is specifically designed for AR rifles and optimized to be feasibly used with 5.56 rounds. It would be your premier option to fulfill your hunting requirements in particular. This scope is best suitable for low light shooting purposes which could be tactical training, self-defense practice and primarily the target hunt ventures. 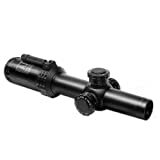 Bushnell launched this rifle scope with the aim of proving the hunters easy and fast illumination changes for all situations. For this, the unique throw down PCL lever is added to this scope for quick adjustment of the power dial. From dawn to dusk and even in darker nights, now you can shoot for all short to long distances accurately with this scope attached to your AR rifle. These all imperative aspects has made it truly a practical scope that you can use in any situation. Throw Down PCL lever: Integral Throw Down PCL lever allows for lightning quick magnification changes.This feature is added by Bushnell so that you can make quick power changes as per your requirements. For me it’s a rocking lever; hates off toBushnell for this smart idea.It turns so easily and smoothly that I found my thumb working very much nicely. You can flick it out and reposition simply with one finger. Optical System: Completely multi-coated optical system enhances the light transmission and improves clarity level. No noticeable blur in the corners and hence you will enjoy excellent optics quality. Zero reset Turrets: Turrets in this scope will certainly provide you a solid feel and noticeably you can make easy clicks. The Bushnell rifle scope reportedly holds the resettable zero. 0.1 Mil click adjustments are tactile and audible bringing more ease while using the scope. First focal plane: First focal plane reticle offers accurate ranging to aim and shoot at any magnification.With this feature, the BDC values remain constant at any of your selected power setting. On the whole, Bushnell did a great job by introducing this rifle scope. The excellent quality FFP illuminated glass and the great reticle with affordable price has made this scope a must-have for your AR rifles. This rifle scope offers great optical precision coupled with rugged reliability and brilliantly uncompromising performance. I don’t like to switch to any other scope when I want to spend my quality time as hunter. A rifle scope is nothing without incredible brightness, and here in this scope fully multi-coated optics will help you out in this regard. BTR-1 illuminated First Focal Plane reticle of this scope gives off a very efficient and low-light quality as well as accurate holdovers for at least 500 yards. With target turrets of .1 Mil click value, you can easily make precise adjustments. I find this scope it not only weather resistant but also rustproof and virtually a scratch proof rifle scope. You can use it even with you expensive AR rifles fearlessly of any long lasting damage. Buying Bushnell AR Optics 1-4x 24mm FFP Illuminated BTR-1 BDC Reticle AR-223 Riflescope means you got an awesome add on for your rifle for an excellent price and your job will surely be done. Everyone wants to get great items but in minimum cash. This is the scope for your rifle available at very much affordable price in the market. It is made up of aluminum alloy providing great flexibility and durability. BTR-1 illuminated reticle will help you in low light shooting and precise accuracy up to 500 yards. In my hunting ventures, I always need quick power adjustments. Thanks to Bushnell’s to add Power Change Lever in this scope. I simply love it. I found its BDC values consistent to all varied power settings. What are types of rifle that this scope will fit? This rifle scope is only compatible with AR platform rifles not otherwise. It also functions pretty well with China made Norinco M4- a variant of AR 15 rifle. If you want owning a quality rifle then Bushnell AR Optics 1-4x 24mm FFP Illuminated BTR-1 BDC Reticle AR-223 Riflescope is that scope you would love to go for. For the price, it’s worth investing your money to get long-term benefits.